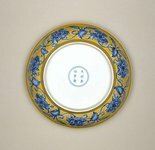 This blue and yellow dish has one of the classic designs of Ming porcelain. While the pattern was created in the Xuande period, the use of the yellow ground became the most popular treatment for this design and perpetuated the tradition of the 'imperial' yellow reserved for the use of the emperor. From early Chinese texts on ceramics we know that pieces of the Hongzhi period were most admired, both for the perfection of the body and for the quality of the yellow glaze. Yellow was the imperial colour, hence a common feature of pieces made for use in the Forbidden City in Beijing. 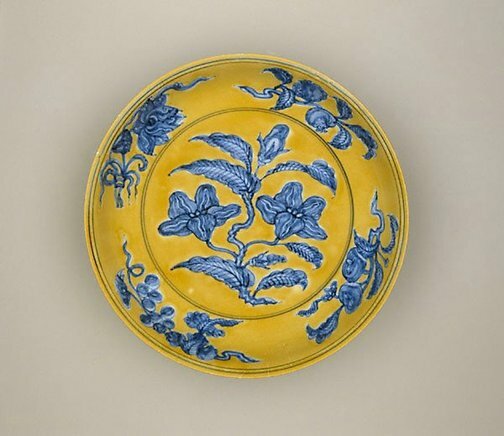 Chinese connoisseurs were particularly sensitive to the quality of the tone of yellow on imperial pieces, assessing it with accurate and evocative descriptions such as the soft colour of steamed chestnuts or the brightness of sunflowers. The yellow on this dish is particularly good. 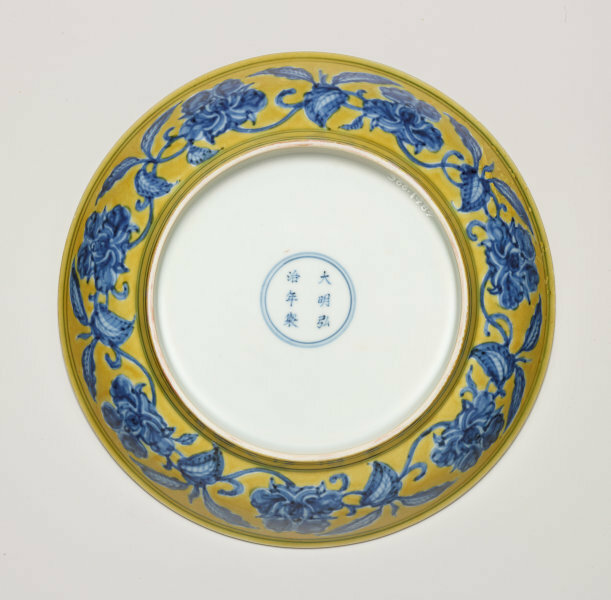 Designs such as this were created by the most regarded artists at the imperial court in Beijing with the drawing sent to the porcelain factories to be copied. The draughtsmanship of the design is exemplary: the central hibiscus spray elegantly fills the space in complete harmony with the form of the dish, while the sparsely distributed leaves and branches are beautifully placed in relation to each other. The Asian Collections, AGNSW, 2003, pg.117. Yin Cao, The Connoisseur and the Philanthropist: 30 years of the Sternberg Collection , 'Chinese Art', pg. 12-23, Sydney, 31 Jan 2014, 16 (colour illus.). Edmund Capon, TAASA Review , 'Spirit Resonance. In Memoriam Goldie Sternberg', pg. 18-19, Sydney, Jun 2003, cover (colour illus. ), 3 , 18-19. Joanna Capon, Art and Australia (Vol. 41, No. 4) , 'Goldie Sternberg. Benefactor', pg. 618-620, Sydney, Jun 2004-Aug 2004, 618 (colour illus. ), 619-620. Bruce James, Art Gallery of New South Wales handbook , 'Asian Collection: East Asia', pg. 246-287, Sydney, 1999, 253 (colour illus.). Jackie Menzies, AGNSW Collections , 'Asian Art - India, South-East Asia, China, Tibet, Korea, Japan', pg. 173-228, Sydney, 1994, 199 (colour illus.). 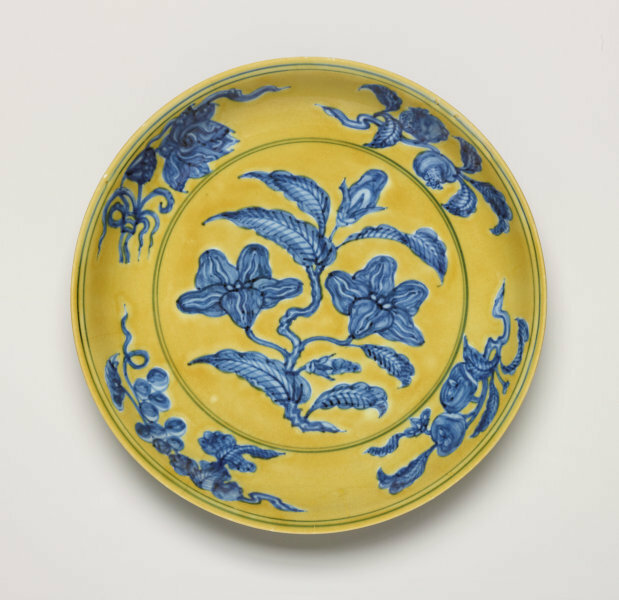 The Asian Collections Art Gallery of New South Wales , 'The Marvel of Porcelain', Sydney, 2003, 117 (colour illus.). Asian Collection Handbook, Art Gallery of New South Wales , 'Chinese Porcelain', pg. 30-41, Sydney, 1990, 31 (colour illus. ).